When operating a taxi business, no matter how big or small, it is critical that you have the right kind of insurance to protect you and your assets from being affected if an unfortunate event were to occur. Some people believe that their personal vehicle insurance is sufficient, but the truth is that is not the case. You will need to have the proper insurance that covers your taxi business to guarantee you are covered in the event of an accident. By not getting the right level of taxi insurance in Florida can put you and your business at serious risk. In fact, if an accident were to occur you could face serious legal issues, not only with those involved in the accident, but from the state as well. It is the law that you have certain coverage if you are operating even the smallest taxi business. This is not a risk that is worth taking. When going about searching for the right level of coverage there are a number of things that you should consider. One of the most important of these is the amount that you will be covered for if one of your passengers is injured in an accident. Even if the accident is not your fault, you want to be sure that any medical needs that they might need will be insured. There is always a chance that the other driver will not have insurance. You want your passengers to be covered in the event that this is the case so that you do not face any legal action. Not having this coverage could lead to them being able to sue you personally or your business, which is something that you do not want to face, even if the issue was not your fault. Being fully protected against this situation is in your best interest. You also want to be sure that every vehicle in your fleet is covered at all times. The best coverage will include a wide range of possible events. Not only do you want your vehicles covered in the case of a driver being at fault, but you want coverage against a variety of natural disasters as well as if someone else is at fault for damaging a vehicle. While ideally they would have insurance, there is always the chance that they are not insured or do not have enough insurance to cover the damages. If you have insurance to cover against this circumstance it is then up to your insurance company to seek compensation for the damages. This ensures that you are able to replace or repair your vehicle in a timely manner and prevent financial losses from a situation that was beyond your control. The better your protection is from the unforeseen the lower your stress level will be. You do not want to have to worry about whether or not you have the proper level of coverage. Instead, you should be able to focus fully on the operation of your business and expanding it. Having the right level of coverage will ensure that you can put all of your energy into doing just that. There is nothing like having peace of mind as a business owner. 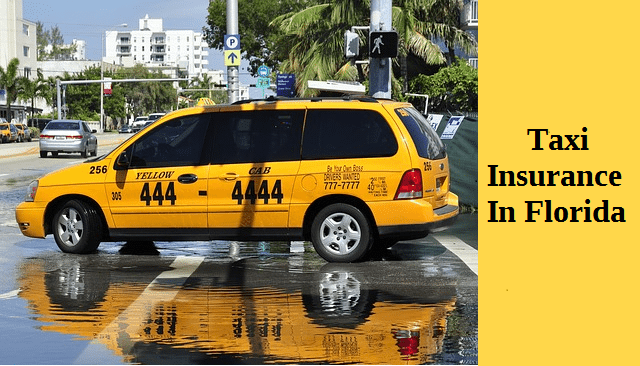 If you are not sure that you have the skills that are needed to purchase a strong, quality taxi insurance policy in Florida, you should seek some assistance from a professional insurance agent . They have the skills and experience necessary to ensure that you get the policy that you need. They can help you to navigate through the entire process and compare the policies that are available in your area. This is one of the best ways to get exactly what your business needs so that no matter what may occur, you will be able to rebound from it quickly without facing financial problems. Many people have the misconception that insuring their taxi fleet is an option, or that they do not need a high level of coverage in order to protect themselves. The truth is that you need to be sure that the level of coverage that you have can cover anything that could possibly occur. For example, accidents are not a common occurrence, but if one to occur, you could face financial ruin if you do not have the coverage that you need against such an event. The worst scenario is to lose your business simply because you did not cover against such a situation. Taxi insurance in Florida is an absolute necessity. You should never operate such a business without securing the proper insurance to protect your passengers as well as your business. Take the time to investigate your options before you even start operation so that you are in the best financially secure situation possible. Read next about the Miami Electrician Insurance .